WHEN I first came to Japan, the only publicly accessible opinions in print about the country were little more than pretentious spitballing masquerading as insight. It’s taken some time, but the tide is finally turning. Noah Smith is an assistant professor of finance at Stony Brook who writes an economics blog. Prof. Smith has lived in Japan and liked it quite a bit. On Friday, rather than write a post about economics, he dealt with a post on another website called Cracked titled 5 Things Nobody Tells You About Living in Japan. (I also read it, but thought it was too puerile to waste time on.) Thing number four was that “foreigners will always be outsiders”. That’s a dead giveaway the speaker/author expected adulation without effort or behavior adjustment and is astonished to find himself on the royal road to obscurity. This runs directly counter to my own experience of life as a Westerner in Japan. Despite the easiness of the (spoken) Japanese language, many Westerners never bother to become truly fluent. The reason is simple; they can get by in the country speaking simple English and broken, simple Japanese. Of course, as the author of the article above suggests, this makes it difficult to really relate to most of the people in Japan. It makes it tough to form close relationships, tough to be included in social activities, and tough to work productively with Japanese coworkers. But because Japanese culture is generally friendly, and because some Japanese people take it upon themselves to speak English to foreigners, these Westerners can manage a sort of stunted, good-enough social life over there without ever spending the effort to become fluent. No wonder they feel like outsiders! What would you expect? What about the cultural attitudes? The xenophobia, the closed society, the racial homogeneity? To be perfectly honest, I haven’t seen much of it. (I)f you are at home in a university setting in America, and if you speak Japanese, you will be at home in a university setting in Japan. And never once has anyone there treated me as an outsider. (W)hen I lived in Japan the first time, I went to plenty of rock and techno shows. I found the people there to be extremely welcoming and friendly – and not just in a “Wow, look, a white guy came to our show!” kind of way, but in a “Hey, want to hop on scooters go out for a beer?” kind of way. (I)f you spend your life speaking pidgin Japanese and walking around thinking “I’m a foreigner, I’m an outsider,” you can easily fail to realize that Japanese people, despite their vaunted “racial homogeneity”, are just as heterogeneous in terms of their tastes and attitudes and personalities as Americans or Canadians or Australians. As in so many situations, individual differences matter far more than group differences. And if you’re walking around Japan feeling a wall of alienation between you and everyone you meet, chances are it’s due to the cultural prejudices of one specific individual: you. One factor behind the alienation is the sense of entitlement many Westerners bring with them to the country as if it were carry-on baggage, and the disappointment that results when they realize the people around them are quite content to live their entire lives without interacting with Our Hero. Some of the commenters to his post beg to differ. I was alerted to the article because I caught a retweet from someone in Japan who read it and agreed with it. Looking at the history of the Tweet revealed that one person thought Prof. Smith’s opinions were “contrary to the evidence and facts”. As evidence he offered a link to the BBC and as facts he provided a link to the Japan Times. By that time I was laughing so hard it was impossible to click on them. A copy of the Tweet was also sent to Hiroko Tabuchi of the New York Times, for some unfathomable reason. No matter where the people employed at that newspaper were born and grew up, they quickly develop an inability to understand anyone living west of the Hudson River and east of Long Island City. Manhattan is one of the most provincial places in the United States. I’m in complete agreement with Prof. Smith on this subject, and dealt with it five years ago in this post called What Japanese exclusionism? The myths live on, alas. One of the points I made at that time is equally true today. I suspect the foreigners who do well in Japan communicate on a sub-verbal level that they are willing to accommodate themselves to Japanese people and their customs rather than demand the Japanese accommodate themselves to them. As Prof. Smith says, if you’re having a problem, the problem is you. It might be that Prof. Smith and I would agree on little else, however. One of the posts on his site is titled “Why I Love Michael Moore”. If I were writing for a website unrelated to Japan, I might title an article “Why Michael Moore is a Transparent Fraud”. He also links to Matt Yglesias, the blogosphere’s version of Michael Moore. 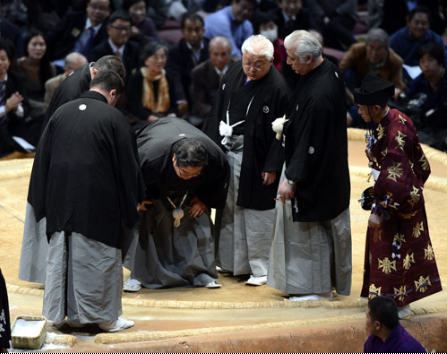 Judges examining the ring to see if sumo rikishi Harumafuji stepped out with his left foot. AN earlier post explained that Osaka Mayor Hashimoto Toru wanted to eliminate the city’s funding for the Osaka Human Rights Museum. He was able to achieve that objective not long ago. Here’s the report on his success from the Yonhap news agency of South Korea, put into English. Right-wing Japanese politician and Osaka Mayor Hashimoto Toru said he will close down the Osaka Human Rights Museum, a comprehensive museum on human rights that includes displays on discrimination of Korean citizens born in Japan (zainichi). According to the Kyodo news agency, Mayor Hashimoto, the head of the national Japan Restoration Party, announced his intention at a news conference to shut the museum and convert the facility into one providing education on modern history to young children. Established in 1985, the museum has operated on admission fees, donations, and subsidies from the city of Osaka. The city will end the subsidies this year. 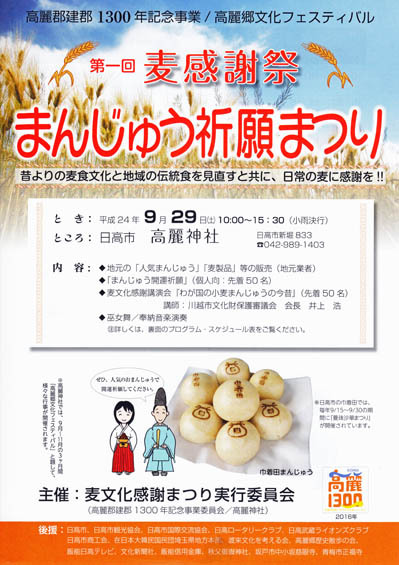 The Osaka Human Rights Museum has discrimination-related exhibits, primarily involving Japan, including those about the burakumin (Japan’s old “untouchable caste”). The comprehensive facility also has displays about discrimination against the zainichi. Mayor Hashimoto’s view is that the museum could harm Japan’s image now that discrimination of this sort has been eliminated in the country, it is not desirable to continue supporting the museum with city funds, and that the museum has to be eliminated through a structural reorganization. But residents who live near the museum, citizens’ groups, and people of conscience have objected, saying the decision is a reflection of Mayor Hashimoto’s right-wing views. * Yes, this is what the South Korean news agency thinks is a straight news article. “Right wing”. “People of conscience”. Then again, they’re in plenty of bad company with the Associated Press and Reuters. * “Right-wingers” presumably aren’t interested in human rights and lack a conscience. That’s only a left-wing thing. Except they’ll self-identify as “moderates” instead. Perhaps the Yonhappers actually believe this. Perhaps they’re using the functional definition of “right wing” as South Koreans apply it to the Japanese — those people unwilling to eternally prostrate themselves at their feet in obeisance to the Joseon history fun house mirror. Or perhaps they’re using the functional defintion of “right wing” that most of the world’s mass media use: Society’s new untouchable caste. * Yonhap couldn’t squeeze into its limited space the information that Mr. Hashimoto’s father’s family were probably burakumin, everyone in Japan knows it, and the people of Osaka voted for him anyway. * The news agency does not disguise their real interest (apart from general Japan bashing): Advocacy of the zainichi, who, after all, intentionally choose to be foreigners in the country where they were born. Ein volk and all that. * How hard can it be to report the truth? Today’s Japanese are tired of wearing the hair shirt before the world to atone for behavior they had nothing to do with. Too hard for Yonhap, evidently. * There is nary a whisper of the fiscal crisis facing the national government and all local governments in Japan. The public sector can no longer afford luxury goods, especially those whose objective is to promote the professionally aggrieved who delight in the opportunity to show us how wonderful they are by showing us how terrible everyone else is and make some money while they’re at it. Nor do they mention Mr. Hashimoto’s willingness to take on other interest groups and labor unions to bring some sanity to the city’s finances. That said, a museum of modern history for children is also a luxury good. Mr. Hashimoto would be better off just cutting the funding and establishing his political identity through different means. He’s had no problem finding other ways to do that so far. It’s not his business if the museum is capable of surviving without government money. By jingo, I think they’ve got it! The question of how difficult life is for the people of North Korea seems not to be such a big issue for the zainichi Koreans (Japanese-born Korean nationals). The problem is that the zainichi who are close to ethnic activist groups and the zainichi community tend to avoid the North Korean issue. They’ve been making the excuse that “the issue will be used by the right wing” for several decades. I’m tired of hearing it. The Japanese government gives JPY 160,000 a month (slightly more than $US 2,000) as scholarships to students from China who attend Japanese universities. The money does not have to be returned. There are about 80,000 Chinese students in our universities. National government scholarships of this type are not given to Japanese students. Therefore, universities are actively soliciting students in China to come to Japan. Is this a desirable state of affairs? ONE of the more controversial proposals of Japan’s Democratic Party government is to give people with permanent resident status the right to “participate” in local elections. The assumption they wish everyone to make is that this means voting. But the actual Japanese phrase used is “participation” rather than “voting”. That euphemism contains the implication of non-citizens being allowed to stand for office, which would surely be the next demand. Need it be mentioned that the agitation to further extend the privilege to national elections would start shortly thereafter? We’ve all seen how certain political elements behave once they jam their foot in the door. Indeed, jamming their foot in the door is an integral part of their strategy. The opposition parties insist the Constitution prohibits this “participation”, and some of them have written proposed Constitutional amendments that would remove any ambiguity about citizenship being a prerequisite for political activity. To clear up any possible ambiguity: This legislation is not intended to enfranchise people such as me — permanent residents with citizenship in countries outside the region. It is to enfranchise native-born ethnic Koreans who choose Korean citizenship. The DPJ position is based on several factors. These include political contributions from ethnic Koreans, some DPJ members who have hung their Korean ethnic heritage in the back of the closet, and the antipathy of some in the party to the nation-state concept. A somewhat benign form of that third factor was manifest in former Prime Minister Hatoyama Yukio’s peculiar claim that the Japanese archipelago did not belong exclusively to the Japanese people. Most of the Japanese archipelagians thought that was errant nonsense. But they knew Mr. Hatoyama was lighter than air, and discounted his notions in the expectation that the DPJ might deliver some of the domestic political reform they promised. That was, after all, the primary reason they were voted into office. It was only a matter of weeks before the voters realized the DPJ promises were lighter than helium. There are 578,135 Koreans living in Japan — 461,627 with permanent resident status, and 116,508 without that status. Interest among them is growing in the 19 December presidential election in South Korea. The South Korean Central Election Committee estimates that 462,509 of these people in Japan, or about 80% of the total, are eligible to vote. This year, South Korean citizens living abroad will be eligible to vote in the presidential election. The number of registered voters for the National Assembly election held on 11 April totaled only 18,575 people, or 4.02%. Of the registered voters, only 9,973 actually cast a ballot, or 52.57%. The atmosphere has changed before the presidential election, however. Interest is rising in the possible winner of the the election as bilateral relations are chilled due to the Dokdo controversy. Some ethnic Koreans wonder which candidate will pull Korean-Japanese relations toward stability. There are also many among those eligible to vote intensely curious about the issue of Korean citizens voting in Japan, and the ethnic education of Koreans there. As of 1 October, with just 19 days left to register for the presidential election, the number of registered voters in Japan totaled 15,986, or an estimated 3.45% of those eligible. That is 1.7 times higher than the number who registered for the assembly elections in April. * Yonhap is excited because as many as 3.45% of those eligible in a particular district have done their civic duty at a distance and registered to vote. If the earlier election results are a guide, only about half of these will be able to muster the energy to fill out and mail in the ballots. Why should it be cause for excitement that the number of overseas citizens interested in a presidential election is 1.7 times greater than the number of the same citizens interested in a legislative election? I’m an American living overseas with a better idea of the positions and accomplishments of both major presidential candidates than a lot of people in the United States. Yet I wouldn’t know who was running for the House or Senate in the four states that I once lived in if they walked up and bit me. If any of these South Korean “citizens” have ever lived in their district of eligibility, and are conversant about the candidates in that district, the number is miniscule. * According to Yonhap, some ethnic Koreans wonder which presidential candidate in South Korea will contribute to stability in Korean-Japanese relations. I can answer that question: None of them. There are two reasons for that. One is that none of them are interested to begin with. The other is that the South Korean polity will, by its nature, ensure that any candidate who might be interested will conceal that interest to ensure his political viability. * Yes, the phrase “ethnic education” does have a tinge of the ein volk, doesn’t it? But the real issue, which Yonhap ignores, has nothing to do with “ethnic education”. Schools for ethnic Koreans already exist in those areas with a population sufficient to support them. The intense interest is in whether or not parents who send their children to these schools should receive the same government subsidies that parents who are Japanese citizens receive for sending their children to private schools teaching a Japanese curriculum. In other words: Where’s my free money! Most of the schools for ethnic Koreans, incidentally, are operated by Chongryeon, the local citizens’ group associated with North Korea. Their curriculum is based on the glorification of the Kim Dynasty and the defamation of the country that allows them to operate. (D)ue to the influence from the conservative wing, symbolized by ‘distortion of the history textbook’ and ‘worship of the Yasukuni Shrine’, the legislation has been delayed, and the law is still held under its pending state. On the other hand, more than a few Japanese citizens have an intense interest in answers to their questions: Why should their tax proceeds be used to fund the “ethnic education” of the children of people born and raised in Japan who insist on maintaining Korean citizenship? And: Why should they allow demi-separatists too lazy to exercise the privileges of citizenship in the country to which they pledge allegiance, to establish ethnic enclaves and vote in elections in a country to which they won’t pledge allegiance? Other than the demand to satisfy a hypertrophied sense of entitlement, that is. Prostitution is the only way for South Koreans to make any money during short term stays in Japan. – A man named Kim after being arrested by Tokyo police on 26 September for running a call girl ring, called the Oppa Club, in Arakawa Ward. Police said the suspect Kim scouted South Korean women in their 20s and told them they could make JPY four million a month through prostitution (slightly more than US$51,000). He put them up in three different units in a Taito Ward condominium and sent them out on an outcall basis using a unlicensed Korean cab driver. Police suspect he employed as many as 15 women at once, and averaged monthly revenue of JPY 16 million. The Ministry of Education doesn’t conduct these hair-splitting investigations of other schools for foreigners the way they do for Chongryon schools. It’s just sophistry for them to keep saying they’re still conducting an investigation. We’ve been liberated from Japanese colonial rule for more than 60 years, but they deny us our schools. We will not permit the repudiation of our children as Koreans. – The head of the liaison group for the mothers’ associations of Chongryon schools in Japan. Chongryon is The General Association of Korean Residents in Japan, and it is affiliated with North Korea. They operate schools in Japan with pictures of the Kim family dynasty on the walls and a curriculum that glorifies the juche system. They’re complaining because they don’t receive the same financial subsidies from the Japanese government that other schools do. The mothers’ associations are called omoni-kai. Kai is the Japanese word for an association, while omoni is the Korean word for mother. Speaking of omoni, in April this year the Chinese wax museum honoring great persons in history and the CCP donated a wax statute of Kim Jong-suk, the Great Mother (of Kim Jong-il), to North Korea’s International Friendship Exhibition House. The wax figure of the Great Mother is wearing a uniform of the anti-Japanese guerilla army and is placed next to azaleas with Mt. Paektu in the background. The video is worth watching to see how services are conducted in the state religion. All you have to do is look. SOME people in medieval times believed the osprey caught fish by mesmerizing them. Once they fell under the sea hawk spell, the finsters floated upside down to facilitate their flop into the osprey belly. That’s what Shakespeare was referring to in the passage quoted above. The fish weren’t turning belly up at the Ginowan Seaside Park in Okinawa yesterday, just a few minutes as the osprey flies from the Futenma air base. 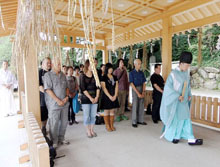 The Okinawans already felt betrayed by Hatoyama Yukio’s false promise of three years ago to have the base moved either outside the prefecture or outside the country. Now it gets even worse: The arrival of the Osprey VTOL aircraft that has crashed or suffered other accidents several times throughout its development and deployment. The most recent incidents occurred in Morocco in April and in Florida in June. That would be dangerous enough at an Air Force base or an aircraft carrier, but danger is part of their job description. The Futenma base, however, is smack dab in the middle of a 19.7 square-kilometer island and the city of Ginowan, with a population of nearly 100,000 people. The various party caucuses in the prefectural assembly and the prefectural federation of local chambers of commerce and industry formed an executive committee to hold a demonstration against the planned October shift of 12 Osprey from Yamaguchi to Futenma. Another demonstration in a different part of the prefecture was organized by representatives from 36 municipalities. 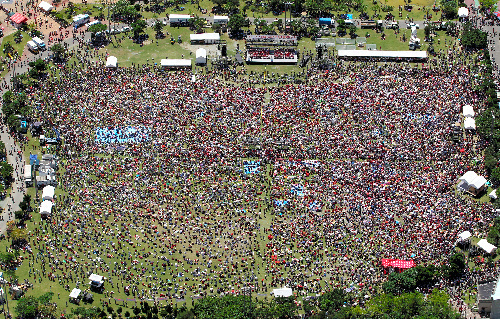 As for the degree of opposition, an estimated 101,000 people showed up yesterday. Organizers are known to exaggerate crowd sizes, but you can use the following video to make your own estimate. It’s also worth watching to see how the Okinawans behave in comparison to the Occupyans. UPDATE: An Osprey had to make an emergency landing in North Carolina over the weekend, and reporters asked Chief Cabinet Secretary Fujimura Osamu about it at a news conference today. That the government is forced to answer questions about individual incidents concerning an aircraft under the control of another country on the other side of the world indicates the state of mind of much of the Japanese public. When I asked my Chinese husband what he thought of all these territorial disputes, he answered, “My grandfather on my father’s side is Chinese, my grandfather on my mother’s side is Korean, my grandmother on my mother’s side is Russian, and I’m married to a Japanese. You can call me “Mr. Territorial Dispute” or “The King of Territorial Disputes”. THE state-run Chinese news agency Xinhua has observer status at the twice-daily news conferences conducted by Japan’s chief cabinet secretary. They seldom ask questions, but the Xinhua reporter asked questions today — seven of them in rapid succession. They were in reference to Prime Minister Noda Yoshihiko’s statement that he would consider dispatching Self-Defense Forces to the Senkaku Islets. * “In your response to the Senkakus, are you considering diplomatic efforts to avoid military disputes? Meanwhile, down in the South China Sea, the Chinese government created a new city by fiat with the name of Sansha on Yongxing island, which is 350 kilometers from Hainan Island. Sansha translates as “three sandbanks”, so it is unlikely that urban sprawl is a pressing issue for the city fathers. The island is half the size of New York’s Central Park and has a population of 1,100 who get their fresh water delivered by freighter from China. It’s a 13-hour trip. Official broadcaster China Central Television aired Tuesday morning’s formal establishment ceremony live from Sansha, with speeches from the new mayor and other officials. The official Xinhua News Agency reported earlier that Sansha’s jurisdiction covers just 13 square kilometers of land, including other islands and atolls in the South China Sea around Yongxing, but 2 million square kilometers of surrounding waters. 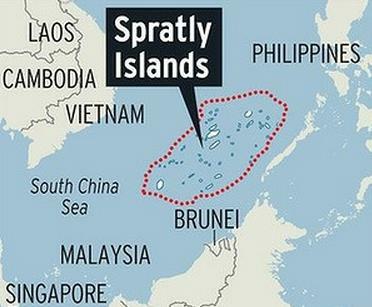 Part of the territory that China claims is another submerged reef, which is not allowed by the UN Convention on the Law of the Sea. This report says the city has 45 deputies in a people’s municipal congress, all for a city of 1,100. Now that’s representation. The delegates account for slightly more than 4% of the population. If the same proportion were applied to the national population, China would have 53.3 million people sitting in municipal congresses. City Council meetings would become the new spectator sport. Speaking of city fathers, the reports say the new mayor was “elected”. Perhaps Sansha is also a laboratory for budding Chinese democracy. Yeah, sure seems that way, doesn’t it? Wonder if the expert read the China Daily account? The Ministry of National Defense on Thursday announced the appointment of major officers to the Sansha military garrison, saying China’s military establishments in its own territory are irrelevant to other countries. Students of diplomacy might compare and contrast that with Fujimura Osamu’s statement. The new garrison is not the first military facility on the island. They already have a naval facility there. It’s almost as if they were looking forward to expecting trouble of some kind. China Central Television has an English-language news report that you can see here. “In your response to the Spratly Islands, are you considering diplomatic efforts to avoid military disputes? But we already know what the answers would be. And the people with the eyes to see already know what is going on. The Liberal Democratic Party and the Democratic Party have agreed through discussions to raise the consumption tax. As expected (LDP head) Tanigaki’s demand for a Diet dissolution and a general election are gone with the wind. The results of these discussions show that the LDP has joined Noda’s DPJ on the road toward a tax increase, and so they are helping him extend the life of his government. The LDP is now no longer an opposition party, but a wretched group that is devoted to becoming part of the ruling party. The LDP went into the opposition after its 2009 defeat, but it seems to be over for them now. Meanwhile, the Noda DPJ has completely abandoned its manifesto and has clearly become the #2 LDP. This development is extremely easy to understand. At any rate, there will be a general election by next summer. It will give the electorate a clear choice: either the Noda + Tanigaki “DPJ-LDP”, or other groups. Both the LDP and the DPJ are on the same page with their aversion to dissolving the Diet. Tanigaki, who insisted on a dissolution, has become a clown. Their fear of a dissolution is proof that they think they’ll lose. But the hands of the clock have moved, and they can’t be turned back. So at this rate, the consumption tax will rise, electric bills will rise, companies will move overseas, and the economy will grow worse. Overseas interests will buy up the few remaining blue chip companies, they will be managed by foreigners, the number of regular employees will decline, and they will be staffed entirely by temporary employees. New university graduates will have just as much difficulty finding a job as their European counterparts. The next election will be the last chance to put a stop to this. The strength of SMBEs is their extraordinary ability to develop new products. That should allow them to survive, but foreign capital will become aware of them and buy them up. People will suddenly notice that the company president is Chinese, and there are many Chinese everywhere you look. That will become the new normal. A lot of people say they hate political crises, but this is really about the lives of the salarymen. To say “enough of the political crises”, as if it were someone else’s affair, is a symptom of the terminal stage of the “boiled frog syndrome”. You suddenly become aware that you’ve been boiled. I cordially request those people who say they don’t know anything about the “boiled frog syndrome” to boil until they turn a bright red.